"Where in Scripture Does Jesus Speak of His Body and Blood as Food?" 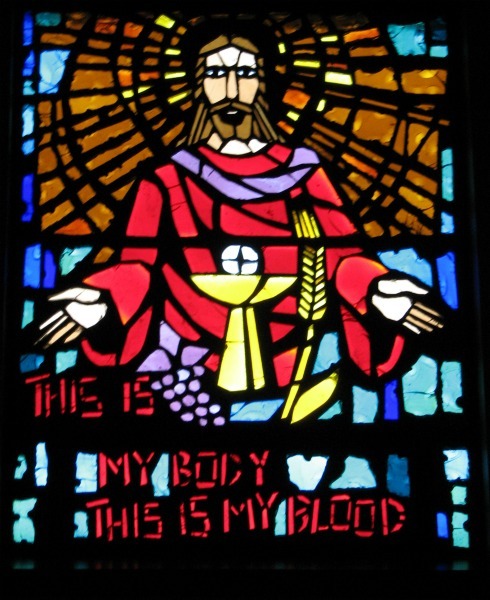 "Where in Scripture Does Jesus Speak of His Body and Blood as Food?" The Eucharist is a sacrament in which is contained, by the marvelous conversion of the whole substance of bread into the Body of Jesus Christ, and that of wine into His precious Blood, truly, really, and substantially, the Body, the Blood, the Soul, and Divinity of the same Lord Jesus Christ, under the appearance of bread and wine as our spiritual food. The Catechism of the Catholic Church teaches in paragraph 1324: “The Eucharist is ‘the source and summit of the Christian life.’ The other sacraments, and indeed all ecclesiastical ministries and works of the apostolate, are bound up with the Eucharist and are oriented toward it. For in the blessed Eucharist is contained the whole spiritual good of the Church, namely Christ himself, our Pasch." But where in the Bible does Jesus explicitly say that He will give us His flesh to eat? We are all familiar with the institution narratives in the Gospels, specifically Luke’s Gospel, because we hear it every week at Mass. It is the first place most Catholics will turn to show that Jesus Instituted the Eucharist: “And He took bread, and when He had given thanks, He broke it and gave it to them, saying, ‘This is my body which is given for you. Do this in remembrance of me’” (Luke 22:19). However, the Sixth Chapter of the Gospel of John (one which every Catholic should read and be familiar with) gives us the “Bread of Life Discourse”. This Chapter is one of the most important sermons Jesus ever preached but also one of the most disastrous from a human perspective. Beginning in verse 35, we see Jesus calling Himself the “Bread of Life,” and saying that we must eat His flesh and drink His blood—something which is forbidden in the book of Leviticus (17:10). The Jews who are listening are scandalized by this and begin to murmur. What is interesting is that Jesus, knowing that those listening to Him are disturbed by His words, never back pedals. Instead, Jesus intensifies what He says. In the original Greek (John 6:49, 50, 51, 53), Jesus made use of a more common verb for eating, (Gk. Esthio). However, beginning in verse 54, after the Jews dispute among themselves, Jesus changes the word to (Gk. Trogo), which means to “chew” or “gnaw” like an animal. In John 6:60 we read, “Many of His disciples, when they heard it, said, ‘This is a hard saying; who can listen to it?’ But Jesus, knowing in Himself that His disciples murmured at it, said to them, ‘Do you take offense at this? Then what if you were to see the Son of Man ascending where He was before? It is the spirit that gives life, the flesh is of no avail; the words that I have spoken to you are spirit and life.’” Here Jesus explains how this will all take place: “It is the Spirit that gives life,” so they must wait until the Spirit is given, the Spirit that raises the Body of Christ from the dead. It will be the Holy Spirit that makes Christ’s flesh and blood holy, glorious, and powerful, as food for our souls and bodies. In verse 66, many of Christ’s disciples leave. Jesus never tries to stop them; in fact, Jesus turns to the Apostles and asks if they too wish to leave. In every other instance, when the disciples find something hard to understand, Jesus is quick to explain what He was trying to say, but here we find Jesus allowing words to remain “scandalous”—even for the Twelve. If Jesus was speaking figuratively, He would have taken the time to make that clear to His disciples, but He doesn’t.